Dual voltage 12v/24v 3 LED white warning lamp. Selectable multi-flash patterns. Lamps can be synchronized. Low current draw. Dedicated cable lengths and connector combinations available. Enquire for more information. 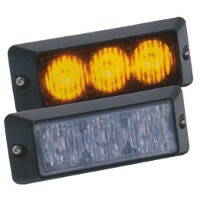 Dual Voltage 12v/24v 3 LED amber warning lamp. Selectable multi-flash patterns. Lamps can be synchronized. Low current draw. Dedicated cable lengths and connector combinations available. Enquire for more information. Dual voltage 12v/24v 3 LED blue warning lamp. Selectable multi-flash patterns. Lamps can be synchronized. Low current draw. Dedicated cable lengths and connector combinations available. Enquire for more information. Dual voltage 12v/24v 3 LED red warning lamp. Selectable multi-flash patterns. Lamps can be synchronized. Low current draw. Dedicated cable lengths and connector combinations available. Enquire for more information. Dual voltage 12v/24v 3 LED green warning lamp. Selectable multi-flash patterns. Lamps can be synchronized. Low current draw. Dedicated cable lengths and connector combinations available. Enquire for more information.